Privately owned static caravan on St Helens Holiday Park. Comfortable accommodation sleeps 6/8 people. 3 bedrooms (1 double bedroom, 2 twin bedrooms plus double pull out bed in lounge. Fully equipped with central heating, double glazing, electric shower, Freeview TV and my own Wi-Fi installed. The lounge, diner and kitchen area is open plan with a separate hall leading to 3 separate bedrooms, a separate shower room and separate toilet room. (See photos).There is plenty of parking and park facilities include outdoor heated pool (open May to September), play areas, games room, launderette, Bar B Q area and plenty of open fields for ball games, dog walking. The park is peaceful with no clubhouse or entertainment so not noisy but there is a family friendly pub 2 minutes walk away serving food all day. St Helens beach is a 15 minute walk away or 2 minute drive (pay & display parking is available) and is ideal for children and dogs. National Trust land is behind the beach. A restaurant, café and public toilets are also at the beach. Weekly, 2, 3 and 4 night short breaks all year round. Price varies according to the time of year. St Helens is a village with lovely views of the Downs situated close to Bembridge village, harbour and beach and 30 minutes drive from the car ferry (Fishbourne,Ryde). Shanklin is a 20 minute drive, Sandown and Brading are a 10 minute drive away from St. Helens so there are many choices of restaurants, pubs, shops and beaches. Horse riding, sailing and water sports are all close by. St Helens has lovely views of the downs with a massive village green, close to the beach, a pub which serves food all day, post office, shop, restaurants and medical centre. Easily reached with a car when self catering is a 24hr Tesco, Co-op, McDonalds etc. Without a car the local shop is open until 8 p.m. every day and 2 minutes walk from the park. The area and the caravan were fantastic. The area was very picturesque and the caravan was ideal for the 6 of us. There was plenty of space and it had a lovely shower and heated up really quickly which was great as we got back late at night. Caroline the owner was lovely very welcoming and told us shortcuts to the pub and shops which was useful. We had a great holiday and would stay again if we could. Cosy accommodation, close toTESCO EXTRA, pub, convenience store and post office. Short drive to the beach and National Trust facility. We had a great stay. 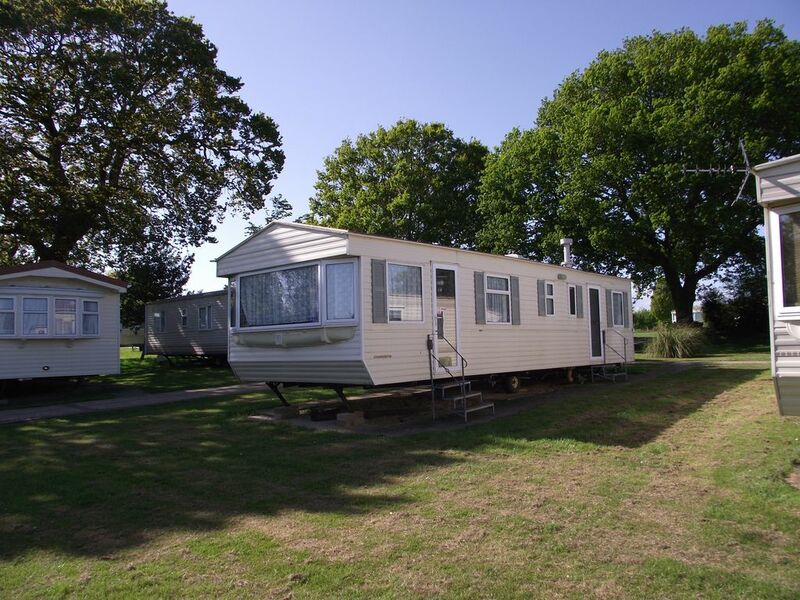 The caravan site is quiet, very well kept, a short walk from the shop, lovely warm pool, easy to find. Isle of Wight is a perfect short break. Caroline is a charming host. The caravan is perfect, clean and brilliant central heating. The location is fantastic for all the family, including the dog! We had hours of fun exploring the surrounding area with our children, in laws and pet shepherd and Caroline is only a call away if you need anything. Loved it so much we are hoping to go again asap! Thank you Amie. Much appreciated! The place was okay but we were very disappointed not to get the caravan we booked instead our caravan was given to another family for some reasons that only the owner understood. We were dumped in a location that is probably not preferred by many as it’s close to so many trees and hedge, not something I would have considered when booking. Your review Esther has been noted. The caravan you occupied is identical to that advertised. The position is in a lovely open quiet area of the park. There are oak trees and hedges everywhere which is the nature of the surroundings. You were not "dumped"! I met you in the car park and escorted you to the caravan and welcomed you personally on time as arranged. You were here for 2 nights only with all amenities. Central heating, wifi etc. After arrival you texted me with a photo of a dinner plate with a small chip on the rim. 8 plates were provided so you didn't need to use it. I offered to replace it but you told me there was no need. After leaving you texted me regarding refund of damage deposit. The website does not refund immediately but I accelerated it for you which I didn't need to do. You had comfortable clean accommodation as advertised. When I met you in the car park you all looked miserable. Not something I encounter ever with guests. Next time you have a break try to relax and crack a smile. It helps.